Gehry in summer 2004, quotes Ratner: "You understand how to put a neighborhood together, and that's what I need you to do." A book that includes conversations between architect Frank Gehry, and his longtime collaborator and friend Ernest Fleischmann, former managing director of the Los Angeles Philharmonic, shows Gehry, in the early days of Atlantic Yards, optimistic about the project and developer Bruce Ratner. Gehry, who called himself a "liberal do-gooder" as he has done at other points, seemed to have convinced himself that doing Atlantic Yards fit into that self-conception. He had to work under what he termed a "tight budget," but that budget, of course, became ever tighter, eventually causing his 2009 ejection from the project. And when Ratner told Gehry "You understand how to put a neighborhood together, and that's what I need you to do," was he just buttering up the architect so as to ensure his participation? After all, Gehry's gone and, despite Ratner's claims and Gehry's aspirations, the architect's strength is in more in constructing striking buildings than in urban planning. 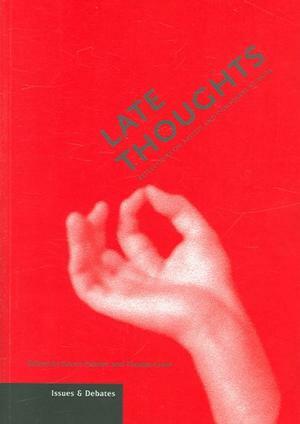 The 2006 book is titled Late Thoughts: Reflections on Artists and Composers at Work, and the relevant passage begins on page 104. Given that the two Gehry conversations in the book took place in summer 2003 (pre-Atlantic Yards) and spring 2004, the discussion of Atlantic Yards had to have been in spring 2004. Fleischmann: At this stage of your life and your career, you are in a position to accept only those projects that really interest you. When there are cost pressures, you don't have to accept a project. Gehry: You may see it that way, but I don't. We've accepted a huge project in Brooklyn--a sports arena [Brooklyn Arena, for the Nets basketball team] together with low-cost housing, middle-income housing, some high-income housing, and office buildings... all on a very tight budget. But I love the challenge to do that kind of project. I'm a liberal "do-gooder." Fleischmann: Is this the first low-cost housing you've done? Gehry: No, near the airport in Frankfurt we did a project for transit workers from Turkey. People have made it into a lively place. It's a wonderful environment. When i started out, I wanted to be a city planner. I went to Harvard University to study city planning, and I found out it was all about government statistics and things I couldn't get interested in. I came out of school hoping that I didn't have to do rich guys' houses, because I was a Lefty do-gooder and I wanted to do big urban projects. But, of course, when you're starting out, that's the last thing you get to do. When I started on my own in 1962, I had only little buildings to do, and I built my practice on that. I took what I got. Today some people say, "Bilbao really fits into the surroundings. You're not just doing little plops in the middle of the street." For the project in Brooklyn, Bruce Ratner called me and said, "I've been looking through your books and I realize that you understand urban design. You understand how to put a neighborhood together, and that's what I need you to do. it's not just an arena that I have in mind; it's the whole neighborhood of housing, office buildings, and so on." Fleischmann: What is it that you understand about urban neighborhoods? What do you want to bring to them? Gehry: If you can make outdoor spaces into public spaces and join them with buildings, that's a piece of a city. It's about the place of buildings within the city. I spent a lot of time making Disney Hall a good neighbor to the Dorothy Chandler Pavilion, the nearby apartments, and what I guessed would be the future around it--tall buildings and stuff like that, which ultimately will cast their shadows on Disney Hall. Remember, Gehry's original plan included public outdoor space on the arena roof--a running track in summer, a skating rink in winter--and vegetation.